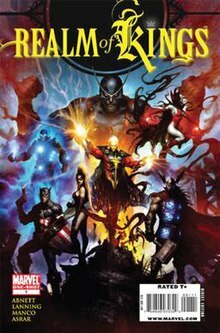 The series started with a Realm of Kings one-shot that establishes the setting and is followed by a number of separate series or storylines which focus on how the different characters, Imperial Guard, Inhumans, Guardians of the Galaxy and Nova, deal with this situation. The storyline also includes the limited series Realm of Kings: Son of Hulk by Scott Reed, with art by Miguel Munera. This focuses on Hiro-Kala and his journey into the Microverse. A giant time-space tear called the Fault had been created by Black Bolt's T-Bomb, killing both himself and the Shi'ar leader Vulcan. The Fault becomes an immediate concern for both the Guardians of the Galaxy and the Nova Corps. They sent Wendell Vaughn, the first Quasar, into the Fault to scout it, given that his energy form would be able to survive its treacherous storms. Quasar soon finds that the Fault is actually a tunnel, leading to another universe which reeked of corruption, ruled by evil organic masses that had consumed their universe like a cancer. It is described as a Cancerverse, where "Life has won, Death has lost." He is captured by that universe's Avengers (called the Revengers), who plan on imposing their Earth on his, to enable their gods, the Many-Angled Ones, to continue to spread. Both the Nova and Guardians of the Galaxy series were put on hiatus following the conclusion of "Realm of Kings" and the events in the storyline lead directly into "The Thanos Imperative". Also the conclusion of Son of Hulk intersects with the end of the back-to-back Hulk storylines "Fall of the Hulks" and "World War Hulks" in the story arc "Dark Son", partly written by Scott Reed. ^ Richards, Dave (August 9, 2009). "CCC09: DnA's "Realm of Kings"". Comic Book Resources. Retrieved August 9, 2009. ^ Richards, Dave (November 17, 2009). "DnA Map Out Their "Realm of Kings"". Comic Book Resources. Retrieved February 21, 2010. ^ Smith, Zack (January 10, 2010). "The SON OF HULK Gets Puny in the Microverse". Newsarama. Retrieved May 3, 2010. ^ Beard, Jim (February 12, 2010). "EXCLUSIVE: The Thanos Imperative". Marvel.com. Retrieved February 24, 2010. ^ McGloin, Matt & Brewer, Byron (February 23, 2010). "DnA Crank Things Up: The Thanos Imperative: Ignition". Cosmic Book News. Retrieved February 24, 2010. ^ Richards, Dave (March 4, 2010). "DnA Issue "The Thanos Imperative"". Comic Book Resources. Retrieved March 19, 2010. ^ Brownfield, Troy (March 4, 2010). "DnA Bring Back the God of Death in "The Thanos Imperative"". Newsarama. Retrieved March 19, 2010. ^ Tacopina, Robert (May 28, 2010). "Dan Abnett & Andy Lanning: A Cosmic Trip Through the Thanos Imperative". Comics Bulletin. Archived from the original on May 31, 2010. Retrieved June 3, 2010. ^ Beard, Jim (June 11, 2010). "Incredible Hulks: Dark Son". Marvel.com. Retrieved June 11, 2010. ^ Pepose, David (June 11, 2010). "DARK SON Rising As The Other Son of HULK Hits Earth". Newsarama. Retrieved June 11, 2010. ^ Phegley, Kiel (June 11, 2010). "Pak Teams Up The "Incredible Hulks"". Comic Book Resources. Retrieved June 11, 2010. This page was last edited on 2 March 2019, at 10:31 (UTC).